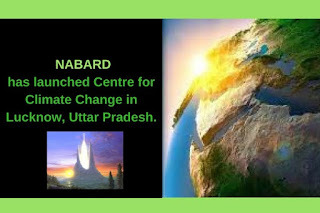 An initiative to work towards tackling climate change .National Bank for Agriculture and Rural Development (NABARD) has launched Centre for Climate Change in Lucknow, Uttar Pradesh. It is a first of its kind centre in South East Asia. It aims at accelerating concerted climate action by various stakeholders in government, private, financial and non -government sectors. The centre will help NABARD in enhancing its capacity building efforts manifold. It will extend professional support to stakeholders for designing climate related projects and take up collaborative studies and action research projects in the area. It will also support capacity building and project preparation efforts in developing countries in the region and also in Africa. It will address capacity building needs of stakeholders, undertake policy advocacy, promote national and international collaborations by bringing in knowledge, technology and finance for addressing the challenges and opportunities emerging from climate change. India has experienced an impact of climate change on agriculture and rural livelihoods. The Government has taken several measures such as promoting micro irrigation, soil health cards, integrated farming models and traditional farming to de-risk farmers from the impact of climate change. NABARD has been engaging itself in capacity building of various stakeholders involved in Climate Change actions. It is the National Implementation Entity (NIE) for three important climate funds, viz. Green Climate Fund (GCF), Adaptation fund of UNFCCC and National Adaptation fund for Climate Change (NAFCC). What is National Bank for Agriculture and Rural Development (NABARD)? NABARD is an apex agricultural development financial institution in India. It has been entrusted with matters concerning policy, planning and operations in the field of credit for agriculture and other economic activities in rural areas in India. NABARD facilitates credit flow for promotion and development of agriculture, small-scale industries, cottage and village industries, handicrafts and other rural crafts. It supports all other allied economic activities in rural areas, promote integrated and sustainable rural development and secure prosperity of rural areas. It is active in developing financial inclusion policy. It is a member of Alliance for Financial Inclusion. It is headquartered at Mumbai, Maharashtra with regional offices all over India. It was established in 1982 on recommendations of Shivaraman Committee to implement National Bank for Agriculture and Rural Development Act, 1981. Q1. Where has NABARD launched the Centre for Climate Change? Q2. When was NABARD established?